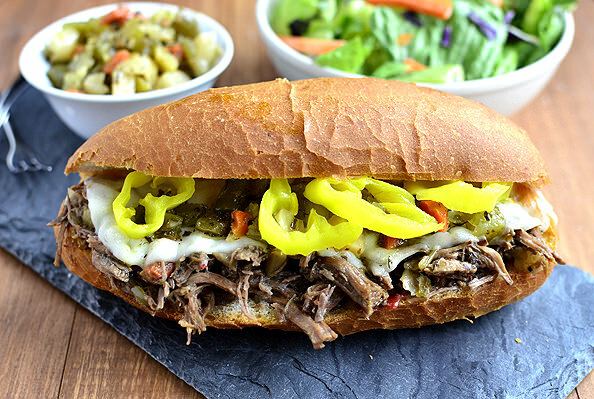 Crock Pot Italian Beef Sandwiches are a 5-ingredient crock pot recipe version of the popular hot sandwich recipe. This easy dinner recipe is a crowd-pleaser! Place chuck roast into the bottom of a 5.5 - 6 quart crock pot then sprinkle with salad dressing mix. Add pepperoncini peppers plus a splash of juice, Giardiniera, and beef broth then lift up chuck roast pieces to get broth underneath. Place a lid on top then cook on low for 9 hours, or until meat shreds easily with a fork. Shred then place meat back into crock pot and cook on low for 1 more hour. Split buns in half then scoop the shredded meat mixture on top and add provolone cheese slices. Top with additional pepperoncini peppers and Giardiniera, if desired, then serve. Good Seasons Zesty Italian salad dressing mix is NOT gluten-free. 0 Response to "Crock Pot Italian Beef Sandwiches"